The reborn pop group Steps have been given some extra glitz and glamour by a talented ceramic artist from the Conwy Valley. 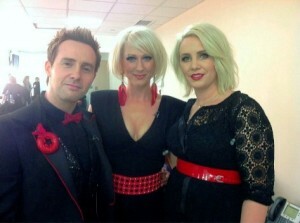 Steps are wearing spectacular, outsize jewellery made by award-winning Catrin Mostyn Jones, from Maenan. The group’s reunion tour is a sell-out and Catrin’s colourful creations are featured in the programme. According to Catrin, none of this would have been possible but for the “fantastic” help her company, Vivid Ceramics, has received from the rural regeneration agency, Conwy Rural Business Support. Catrin said: “The fact that Steps are wearing my jewellery on tour in front of hundreds of thousands of people is a brilliant showcase for Vivid Ceramics. The fact that I have been able to reach this point is due in no small part to Conwy Rural Business Support, they have been fantastic. Members of their team have given me invaluable help in relation to my website and how to bring it up the Google rankings, putting a business plan together and securing funding for match funding to buy a new laptop. I’m a creative person so the world of business is a potential minefield and Conwy Rural Business Support have been essential in avoiding pitfalls that I would not have seen coming”. A farmer’s daughter from Melin-y-Coed, near Llanrwst, Catrin spent more than a decade in the North West of England after graduating in 3D design at Manchester Metropolitan University. 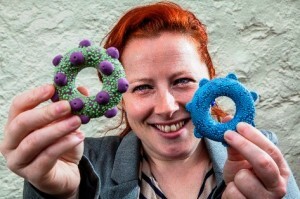 Apart from the jewellery, Catrin makes wall hangings, free standing sculptures, lighting and public art. She was drawn back to the Conwy Valley 18 months ago by “hiraeth”, a longing to return to her roots and the spectacular scenery that inspires her work. It was also an opportunity to reconnect with her school chum Craig, who went on to find fame as an actor in the West End and on S4C. For more information about the support and advice that’s available to small businesses in rural Conwy contact Anna Openshaw either by emailing conwyruralpartnership@conwy.gov.uk or ringing 01492 643159.